Luton chief Nathan Jones was thrilled to see his side confirm their place as Checkatrade Trophy Southern Group H winners by disposing of MK Dons 3-0 last night. Peterborough United’s penalty shoot-out defeat to Brighton U21s after a 2-2 draw in which they had led 2-0 with 20 minutes to go, means that with six points, the Hatters can’t be caught by the other three sides in the group who all have two. That’s good, we wanted to top the group, because that means we get a home game. They still have to visit Posh next month, but will now be guaranteed a home draw in the round of 32 which takes place in December, as Jones said: “That’s good, we wanted to top the group, because that means we get a home game. “I saw an interview with Steve Evans that he went really strong because he wanted to win the game, so he could have a grandstand game against us. Town moved away from their diamond formation during the victory on Tuesday night, opting for a 4-3-3 to utilise Kazenga LuaLua on the left flank. When asked about the switch, Jones said: “We use two formations, anyone who says we have one formation, we don’t, we use two formations pretty much every week. “We go to 4-3-3 and we played a diamond, but we can play a 4-3-3 and that’s why we bought Kazenga in it, so it give us real potency there. “We’ve got Cornick for the other side and we’re always looking to improve, it’s not different for us, we work on those things week in week out and players know it. Town were in front on 17 minutes when Alan Sheehan confidently tucked away his first goal of the season from the penalty spot. The defender used to take spotkicks for Notts County during his time at Meadow Lane earlier in his career, leaving Jones with no concerns over Town’s club captain stepping up. He continued: “His record from pens is outstanding, we’ve got three or four there who take them, Sheez is absolutely outstanding and I’m delighted he did it. “I had utmost faith in him, I’m very confident when Sheez stepped up, I can’t believe we don’t let him take them for the first team, especially last year, but I’ve got strikers who want to take them. 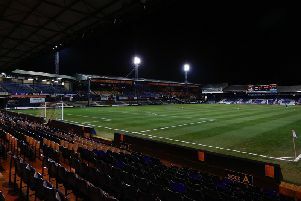 Sheehan was one of the more experienced players on display for the Hatters, along with Alan McCormack, as Jones praised those first-teamers who featured due to a host of injuries at the club. He said: “I’m so proud of them as they’re such a good group and the experienced ones. You put Glen (Rea) in that as well, Shinnie and Jorge Grant, the attitude they showed, the appetite for work the appetite to do well was wonderful tonight. Hatters could and should have won by more on the night, creating a number of chances, as Jones added: “It was just a little bit of cutting edge and we should have been more ahead by half time as we got into their box a lot, as only the last bit of the half did they come into it. “I thought for the full 90 we were excellent, we really were. Ready (Arthur Read) hit the post and he was clean through, (Aaron) Jarvis was through, we’ve had umpteen opportunities. “They had to come out as they wanted to win the game, and 2-0, it’s not a precarious lead, as it’s a wonderful lead, but when they came out and we were on the counter attack, we’re pretty devastating on the counter attack against whoever we play.